In October 2014 or so we started to carry a growing variety of components to build your own multirotor ‘copters. We’d kept up with the Ready-To-Fly out of the box market, but the DIY market was growing and we hadn’t done anything to meet that area of the hobby. Since then we’ve been eager to take some inventory off the shelf and put our theory to the test. 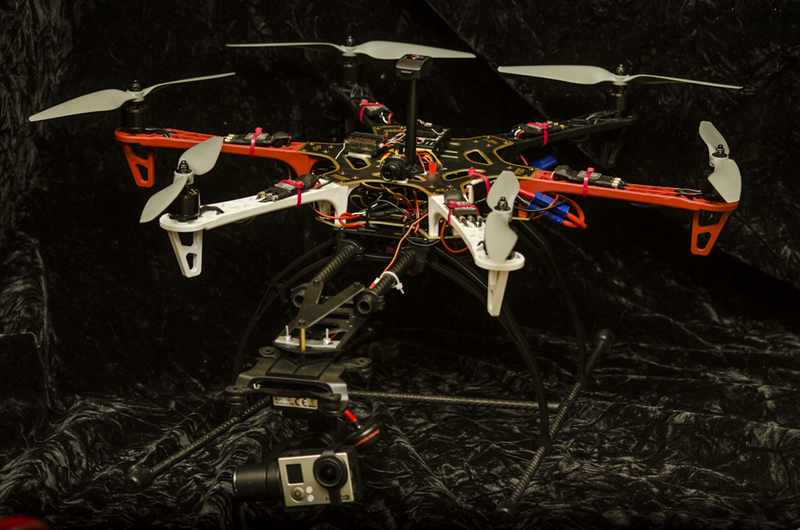 The Guts: I decided to go big and build the F550hexcopter kit from DJI. It is the largest of the three platforms that we carry product for (the others are 450mm and 250mm). I was also curious as to how six rotors would handle compared to the usual four. One important quality of picking this frame is what limitations it provides. These are not drawbacks, so to speak, because literally any platform has some form of limitations. In this case, the 550mm span limits us to a 10” propeller. 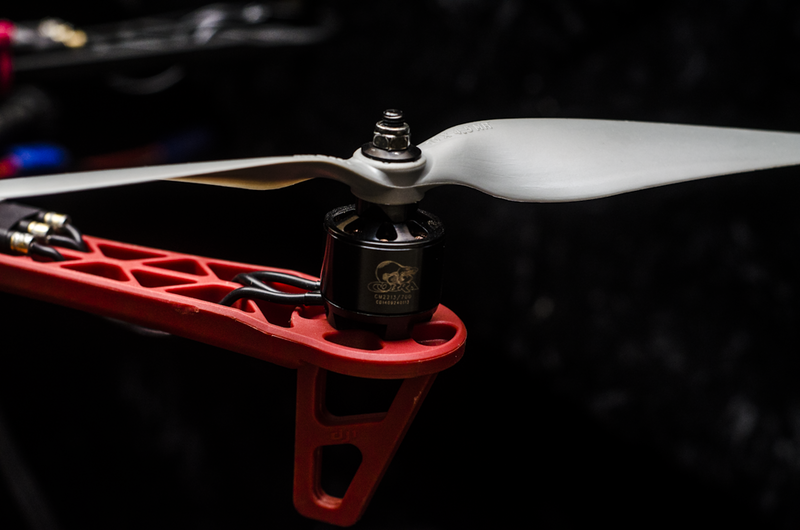 The APC Multirotor propellers are always my first choice. At 10 inches, 4.5 is the only pitch offered, and its very common for multirotors. This propeller helps us to narrow down an ideal motor option. The main line of motors we stock at MTH is the Cobra Multirotor Motor line. The engineers at Cobra provide unrivaled data for their motors. The important thing to look out for is outright thrust. 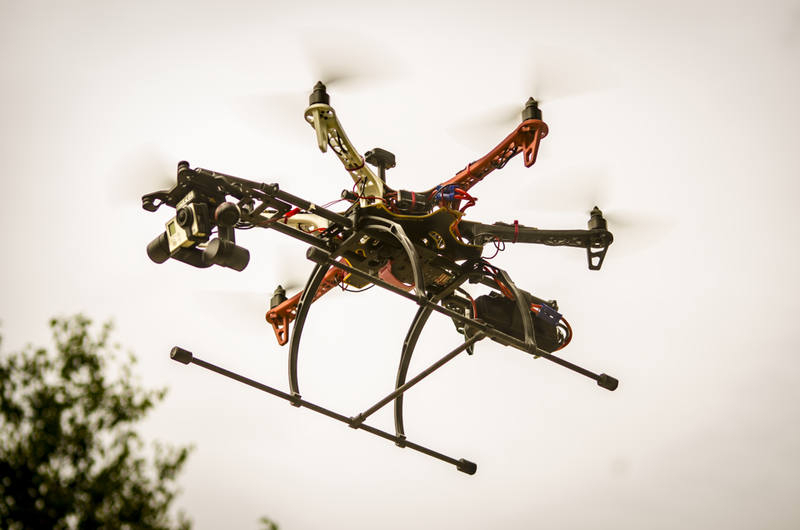 Multirotors perform best when they have a maximum thrust-to-weight ratio of between 2:1 and 3:1. Based on rough math, we’d like an all-up weight of up to 2000-2250g. We’ll need upwards of 4500g of total thrust, split among 6 motors means total thrust per motor should be roughly 750g. The obvious candidate became the Cobra CM-2213/36 700Kv. With a 4-cell LiPo and a 10” APC prop, our max available thrust is 831g, which gives us some excess. Furthermore, our amp draw at max throttle is only 8.28 amps. This keeps our cost of ESCs down. When it comes to the ESCs, one can pretty easily buy the bare minimum and take the risk. I personally prefer to overshoot how much speed controller I need by one step. That is to say, if I only need 8 amps, and the closest is 10 amps, I would actually see if it is cost effective to make the jump to 20 amps. This is bordering on unnecessary, but there is a method to this madness. First of all, the data motor manufacturers give typically doesn’t account for burst current, which varies in nature from continuous current. Second, if I only ever pull 8 total amps from these speed controllers, that means they are running at less than 50% workload, and they’ll usually run cooler, and are at far less of a risk of burning up. Lastly, the cost of the Gaui 10 Amp Multirotor ESC is $10.95, and the 20 Amp is only $14.95. This little security measure becomes the obvious choice. Tracing the signal back even further we come to the flight controller. This is the brain of the build. We decided to put the Eagle Tree Vector to the test. I pulled this unit off of my 250mm race quad, for which the Vector was overkill. 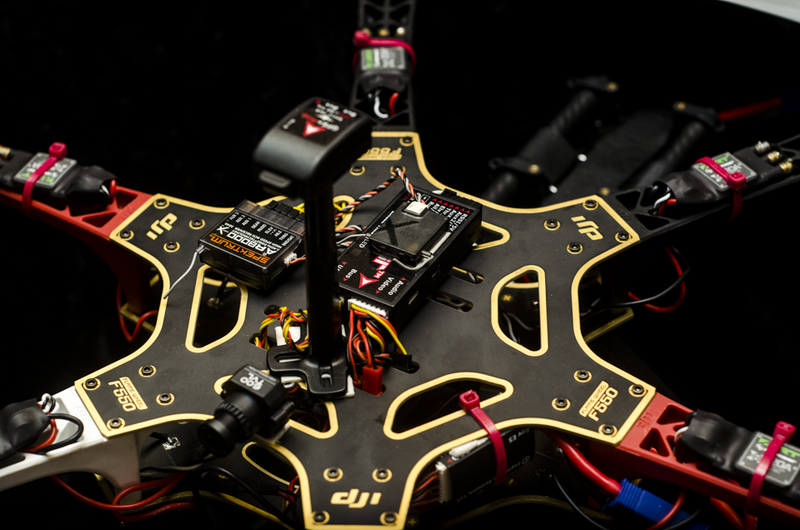 The Vector is perfect for this build, however, as it offers stabilization, GPS functionality, AND an FPV on-screen-display overlay function. This means that when we hook up the FPV gear and watch in our goggles, we see all the telemetry our data can feed us. Things like battery voltage and remaining life, GPS coordinates, altitude, distance from home, and compass heading all become readily available. Additionally, being able to program the entire unit through an FPV menu as well as sporting a super sweet fighter jet heads-up-display make this board an absolute must for the FPV enthusiast. Hooked up to the flight controller is our Spektrum AR8000 receiver. This is again something that is pretty excessive. Usually 4 channels is bare minimum, 5 is sufficient, and 6 is more than ideal. I would recommend to anyone building something of this scale to consider the AR610 instead. I just used the AR8000 because I had it laying around. It is bound to my Spektrum DX8 transmitter. This is also just a little excessive. However, I find that I use a good variety of the features that separates this radio from a DX6i or DX7s. Much like an AR610 is more than ideal, a DX6i would be more than capable of running this setup. Powering this whole build is a Lectron Pro 5200mAh 14.8 volt battery. This series of Lectron Pro batteries have been incredibly popular among our RC truck customers. This battery fits seamlessly within the plates of this frame, as if it were meant to be. We obviously needed a 4 cell battery. Beyond that, our capacity is dictated and limited by how much payload we are comfortable using. This battery ways just around 460g, which is actually considerably lighter than a comparable Hyperion 4S 5200mAh at 572g, which was admittedly my first choice in battery. The Build: This was admittedly the first time I’ve built something of this scale, and I couldn’t have asked for a simpler build process. The DJI F550 frame didn’t come with printed instructions, an unfavorable exclusion at first thought. However, it soon become obvious that the parts of the F550 come together quite intuitively. Another nice feature of this frame is that the bottom plate actually doubles as a power distribution board. The Cobra motors came with an excess of wire, which should be cut down to length to reduce weight once everything is tested. They also need 3.5mm bullet connects soldered on to plug into the Gaui 20A ESCs. The last piece of actual assembly was our PS1 landing gear. This is a complete upgrade over the DJI-branded gear, which are really just four white plastic legs that bolt under the arms. They’re good enough to get you off the ground, but they lack a few options that we wanted on this build. Firstly, we wanted options when it came to mounting the battery. We had mounted everything in such a way that the obvious place for the battery was tucked between the plates in the frame. This is good because it is real easy to keep the battery close to the CG and its a close fit. The problem here is we plan on adding a gimbal and camera. The ideal mounting for the camera would be way out in front so as to minimize the blades in the shot. The farther you stick a weight out from the center of the axes, the farther it pulls the CG forward as well. It needs to be counter-balanced. The PS1 landing gear not only puts the gimbal way out in front but it also puts our batteries on sliding rails, letting us mount whatever, wherever. The disadvantages to this landing gear are two-fold. Firstly, because it has 5 full carbon fiber tubes, some nearly 20” long, the cost is significant. Secondly, it adds another 300 grams to the build, which cuts into our flight time. The all-inclusive PDF manual for the Vector answers almost any question you could possibly have for it, with loads of pictures as well, making hooking these speed controllers up super easy. All of the cables in the included receiver harness are labeled and hook right up to the receiver. I will admit that the only complication I had in hooking up the Vector for full functionality was in hooking up the camera and video transmitter. The way this is supposed to work is that you hook JST male connectors from the included PSU at either 12V+ or 5V+ to the female JST connectors labeled Camera and Vid Tx to power those items respectively. The problem I had was that my camera demanded 5V+, and I was already using the one 5V+ plug to power my receiver. At such a point where my video transmitter was already being powered by the PSU and it was capable of providing my camera with voltage on its own, I simply made a voltage jumper that bypassed the Vector entirely. That is to say, the video signal goes into the Vector and back out of the Vector, while the camera’s power supply comes from the video transmitter. The Flight: Let’s talk about flight. We were very careful taking this build in the air. Its size and power have the potential to do real damage to people and property, so it is very important to exercise caution. We faced some basic setup hurdles along the way. Upon our first few takeoffs, it seemed the hex was pitching towards the rear and to the left. Some things to check here is to make sure you record a level surface for the flight board to recognize as level when it stabilizes. We also made sure our ESCs were all timed correctly. They all came from Gaui in the same shipment, but small inconsistencies in manufacturing lead to big differences in flight. To do this, we plugged all 6 speed controllers into our throttle channel through a number of splitters, and went through our ESC-specific calibration process. 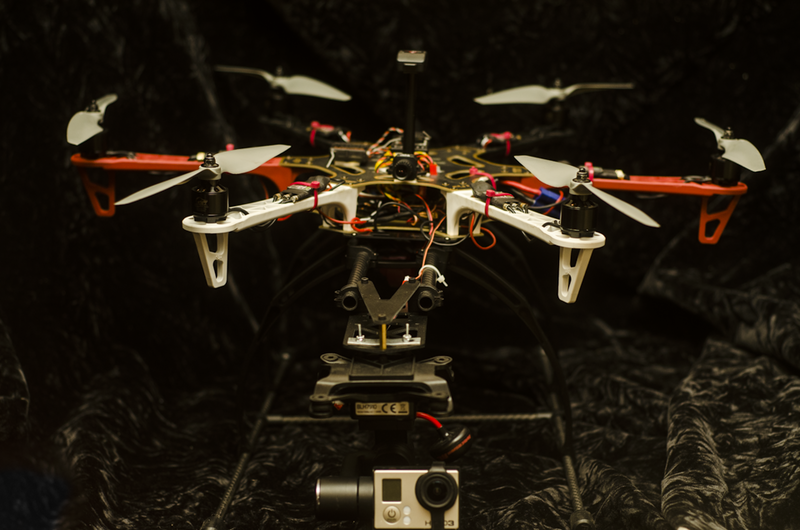 Eventually, we had tweaked and tuned the hex enough to where it was ready for actual flight. The first full flight on the hex was in a park. Our goal was to test the flight time and to test the GPS resolution through using the “Loiter” mode. At this stage we’d not yet installed the landing gear, so we were a bit lighter than our finished build. In the Loiter mode, the hex flew in one spot, give or take about six feet, at one altitude, and hovered for a solid 22 minutes. Yes, that’s 22 minutes of hovering flight. I was absolutely stunned. The stunned-at-first kids actually got bored watching it for that long and left. When it hit about 13.8 volts on the pack, it entered autoland. I was watching the battery, and it really tapered off at the end, so I doubt changing my low voltage cutoff will give me anymore flight. I do, however, wish that the descent was slower, which of course is completely programmable in the Vector’s software. We now have our benchmark of 22 minutes. 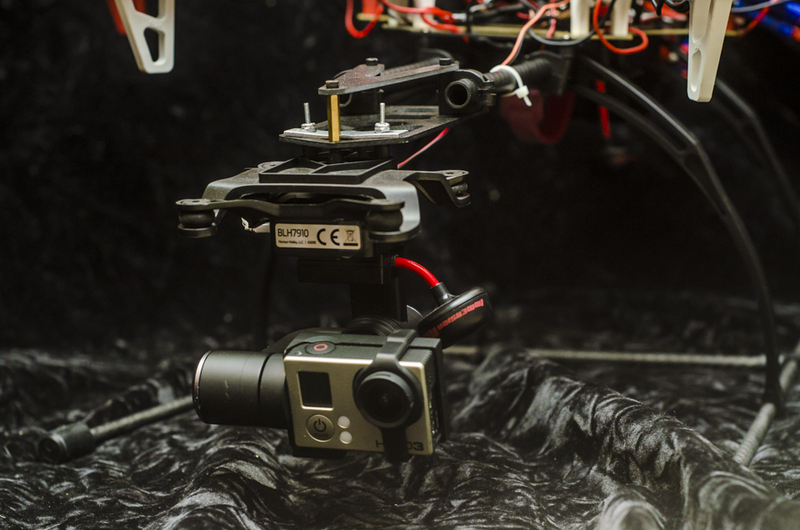 We added 300 grams in landing gear, and we will likely add another 200g or so in camera and gimbal. We may even dare to add another 460 grams in battery. The ideal goal is to hit 20 minutes of Loiter hover with camera and gimbal. The alternative goal is to maintain at least 12 minutes of hover time while using the gimbal, camera, and just one battery, and keeping our other battery for a quick spare. The Science: Let’s take a second here to discuss the point of diminishing returns. This is an idea used in economics but it also applies here. There becomes a point at which the advantage of extra run-time through more battery is literally outweighed by the extra weight of the battery and the added power it takes to lift off and fly. Suppose, for example, that we got 17 minutes of hovering flight, using only one of our two batteries. Then, suppose we decide to add the battery, and because of our extra amp draw and weight, our hover time is only 22 minutes. We doubled the battery but for only five extra minutes of flight. The ideal here is instead to run the two batteries separately, giving us 34 minutes of hovering time combined. We ultimately get to decide the point at which the life of two combined batteries outweighs the life of two separate batteries run back to back. Adding the weight of the landing gear had a tremendous impact on the overall weight of the hex, and therefore, the amp draw of the motors. When we flew the hex with two batteries at once, fully loaded with aerial photography gear, our amp draw was 24 amps across the board, roughly 4 amps per motor. This is still well within the operating range of our motors and our speed controllers, but we literally doubled our amp draw from our first test. Basic logic tells us that since we doubled our amp draw on the batteries, but also doubled our battery capacity, we should reasonably expect the same run time of 22 minutes as when we did the first test. This exceeds our goal of 20 minutes with two batteries! For the sake of science, we also ran the F550 with just one battery, mounted towards the rear to balance the GoPro in the front. This reduced our weight by 460 grams, and decreased our hovering amp draw by 4 amps down to 20. Our test flight showed that we actually get 20% more run-time than the calculator at Digi-Key suggests we should ( http://bit.ly/1KDP1W6 ). That same calculator estimated we should expect 11 minutes with one battery, so I’d say its safe to expect just a little more than that. This comes in right at our goal of 12 minutes of hover time. So which is better? Two batteries simultaneously or two batteries back to back? Let’s consider the two battery scenario. Our weight was 2850 grams, actually over the threshold of what our 2:1 thrust to weight ratio will allow. It will still hover but our maneuverability suffered because of it. The motors were working far too hard just to hover it to do anything else. And this is fine if all we want to do is hover, but it slows down ascent rates and just sacrifices flight quality, in my opinion. Here’s my theory: motor thrust curves on non-linear, meaning the amount of throttle the board sends to the motor is not always proportionate to the power the motor puts out. The graduation is much slower on the low end of these motors, linear in the middle, and then it tapers off at the high end. By staying in the area at the bottom, our flight controllers can more precisely control the output of our motors. The more rapidly the output of the motor changes, the less our flight controllers can predict the response it gets. In other words, the gains we played with in the beginning apply more to the area of the thrust curve that we were in when making those adjustments. All this being said, we prefer to fly this with one battery, and actual tests show that we get as much as 15 minutes of flight. The Final Word: We started this build to showcase what we stock as a hobby shop. It has been a learning experience, and a pleasant one at that. The build itself was far more fun than frustrating, as building things should be. One of the reasons we were skeptical to get into this area of the hobby is because of the complications involved with taking all of these products from all of these different manufacturers and throwing them together without instructions. This was absolutely not the case, as we only had two or three very small complications along the way. In retrospect, this idea was very common when building kit planes was all there was. That’s what made this a hobby. 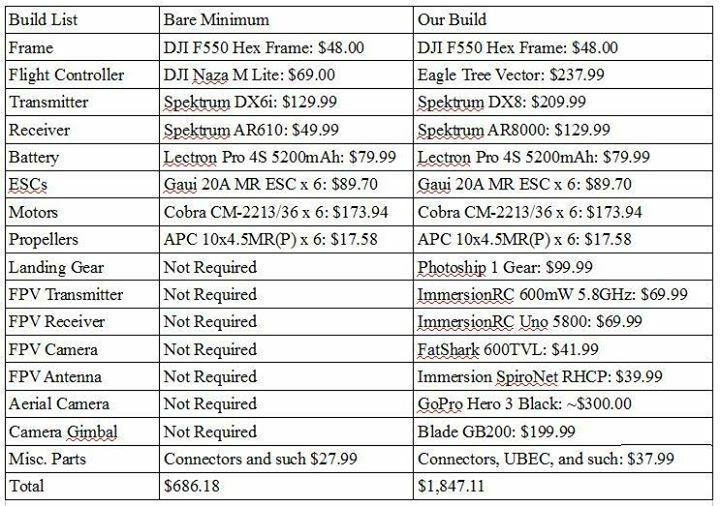 You’ll see our build list and think about how expensive the hexcopter is. But look at it though. For sake of comparison, I want to compare it to the Yuneec Q500 Typhoon, which is significantly cheaper, and make a case for the hexcopter. Firstly, one could build an F550 in the price range of the Q500. Next, one could instead make a quad in the range of the Q500. Having more motors and propellers offers much better thrust efficiency and also offers some redundancy. Both of these multirotors have an FPV system set up. That is to say, all our build needs is a screen or goggles. A small 4” LCD car backup screen for $18 is what I use. Our DX8 transmitter works with our hex just like the ST10 works with the Q500, but my DX8 also flies my 350QX, my two Blade helicopters, and just about any other flying think Horizon puts out (with the exception, of course, of the Q500). Sure, one could buy the Q500 for $1300 ready-to-fly, and call it day. But once that purchase is made, the limitations of that platform are set in stone. There is no upgraded motor option, no chance to upgrade the ESCs, the only improvements to flight are made through firmware updates, and for lack of a better description, you’re stuck with it. And if that makes you happy and you just want to get out and fly, that’s great. And that is the same thing to expect out of most ready-to-fly anything. But for a hobbyist that really wants to expand, and wants the potential to use some of these guts on another model should worst comes to worst, building a multirotor is inevitably in your future. Lastly, its important to note that we built this hex fully loaded. We went with just about every cool option we could. A lot of this hardware actually came off of quads I had already built and had lying around, but that hardware was all bought here at MTH. I had a DX8 as my main radio, and it came with an AR8000 that I didn’t really need in anything else. The Vector came off my 250mm race quad, for which it was truly excessive. The landing gear was only put on to support my GoPro Hero 3 and its gimbal, both of which came off of my Blade 350 QX. The FPV equipment that we used I had left over from both of my quads. So we got to thinking, just how cheap could someone get one of these in the air, ready-to-fly? We put both of the build lists here for you to see how to get these in the air. Thanks for reading everyone. Have fun out there.